Can anyone identify this bush? The photo was taken in May (in South England). It is slowly turning into a kind of a tree, with long branches without any new shoots, so I would like to prune it and turn it into a low bush again but as I don't know what it is not sure when it's best to prune it. 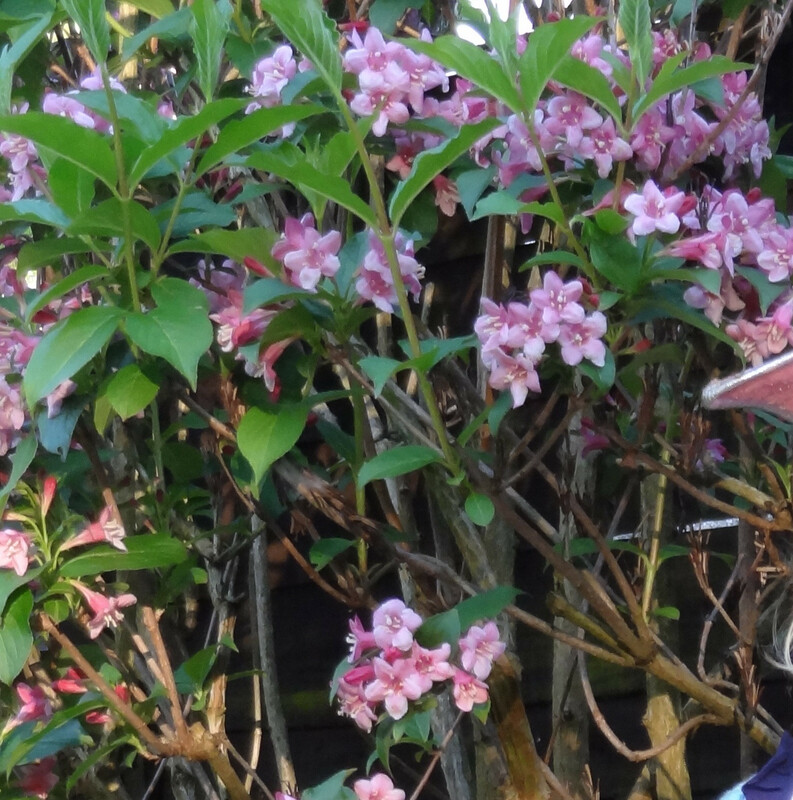 Weigela it is - this is one of the shrubs which can be 'renovated' if it has become congested and choked with wood in the centre. The usual procedure with these is to prune properly immediately after it has flowered, otherwise flowering is non existent or severely reduced the following year, but from the little I can see of yours, it does seem to be somewhat congested. If that's the case, you could cut it down as low as you like now or next month, give it a good feed with something like Growmore in March, and as it grows, shape to your liking. It will, as already stated elsewhere, always want to arch outwards, and carrying out this renovation will mean no flowers for at least 2 years, but you should finish up with something that looks, overall, more attractive. If, on the other hand, you do want good flowering this year, then don't prune now, wait until flowering is over. The leaves are 5–15 cm long, ovate-oblong with an acuminate tip, and with a serrated margin. The flowers are 2–4 cm long, with a five-lobed white, pink, or red (rarely yellow) corolla, produced in small corymbs of several together in early summer. The fruit is a dry capsule containing numerous small winged seeds. This wants to be a large arching shrub. I don't think keeping it as a low shrub will work well. If you don't have room for a large shrub there, consider (re)moving it. Otherwise, you want it to grow with a natural habit, so heading back a lot isn't a good idea. You can start in spring right before bud break. Cut out a few of the thickest, clubbiest stems at the base, and remove any rubbing or dead branches. When cutting a branch, cut back to the base, or a branchlet. Do not leave a stub. You want it to grow up and out from the base, like a fountain. Cut any growth that grows back into the center. You'll probably end up having to prune this each spring for a few years, to get it back into shape. Not the answer you're looking for? Browse other questions tagged identification flowers pruning shrubs or ask your own question. What is this bush/tree and can it be heavily pruned? Is the rapid new growth on this rose bush a sign of Rosette?